« WHAT YOU BELIEVE ? ! YOU BE-COME !! The Hawaiian name for farmer is mahi’ai, meaning “food cultivator” and also “strong, energetic.” That’s appropriate, because farming was even tougher in the old days than it is now, and farmers had to work very hard just to survive. Taro was the most important of all food sources in Hawaii, being the equivalent of wheat in Europe and rice in China. 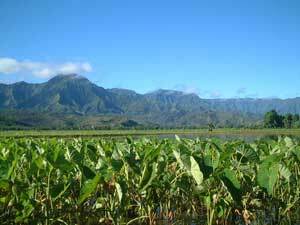 Taro was grown in lo’i, now called “taro patches,” in the valley botoms first, then up the sides of the valley as more food was required. The best taro needed a lot of water, which came from streams or very clever and extensive irrigation systems, but so-called “dry-land taro,” the same taro grown in drier areas, was planted where water was less available. The ever-popular poi is made from mashed, baked taro. The second most important crop was sweet potatoes, because they could provide an abundant harvest in areas further away from water sources, and that was extremely valuable in times of drought. Other food crops included bananas, coconuts, and lu’au, which refers to the top tender leaves of the taro plant that were used as a kind of salad. Breadfruit, sugar cane, gourds, yams, arrowroot, ti plants (the baked roots were used as a sweet treat) and tumeric were additional supplemental plants that were grown. Farmers also raised pigs, chickens, and dogs for food. There were several kinds of wooden tools used by farmers, but the main tool used for all cultivation was the ‘o’o, a digging stick made of hardwood that varied in size and shape. Stone tools were used to make the wooden tools. Although a few chiefs and kahuna worked in the fields, the vast majority of farmers were commoners, and therefore tenant farmers. It was possible for them to leave the land they were on and seek to work somewhere else under a different chief, but for the most part families stayed in the same area for generations, unless war forced them away. The small lo’i patches were grouped into a larger area called an ‘ili. Several ‘ili might be grouped into an ‘apana, but more often they would be grouped into the next and most important land division, the ahupua’a. This was, ideally, a very roughly pie-shaped piece of land extending from the inner reef at the wide end to the mountains at the narrow end. However, some ahupua’a were land-locked, and some did not extend very far into the mountains. Some were quite small, and some, like the Hamakua ahupua’a that covered large areas of Mauna Kea and the coastline, were really huge. All land in ancient Hawaii was the personal property of the strongest chief around. The high chief who owned the whole island or part of it would divided what he owned into large parcels and give responsibility for those parcels to lesser chiefs to manage on his behalf. The lesser chiefs would then appoint an expert in land management called a konohiki to allot land to the commoners for farming, fishing, and the gathering of forest products, to collect taxes, and to supervise bartering between different groups within his ahupua’a. Self sufficiency within an ahupua’a was the ideal, but resources were so unevenly distributed that outside trade was often necessary. This entry was posted on April 6, 2010 at 10:22 pm and is filed under The Science of Health & Exercise. You can follow any responses to this entry through the RSS 2.0 feed. You can leave a response, or trackback from your own site.